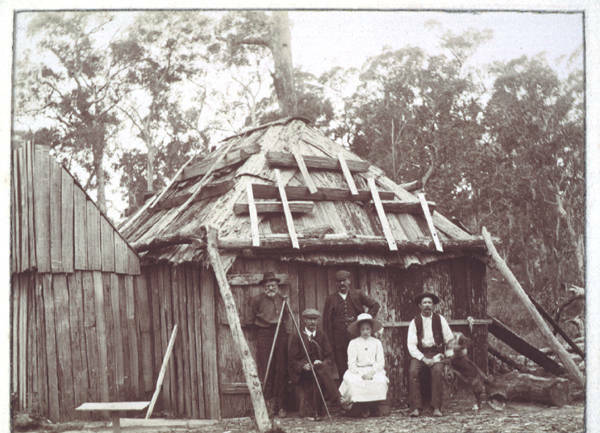 Tasmania owes a debt to its pioneers, those who in each area were the first Europeans to settle and create a community. These early arrivals had to bear the brunt of living in a hostile environment among a community of thieves, bushrangers and dispossessed Aborigines. Apart from these physical dangers, early settlers were faced with the daunting task of clearing large tracts of virgin bush, often with primitive tools, to eke out an often lonely existence far from civilisation. This isolation brought with it dangers, as there was frequently no assistance in the event of an accident, and at first no hospitals, shops, schools, churches, banks, roads and other utilities that later immigrants enjoyed. Many settlers were assigned convict servants to assist with land clearing and farm establishment, and although this had its advantages, it created further problems. Convict servants were often unwilling and untrained workers, and they had to be fed and clothed, which meant that more crops had to be planted to help feed them. Why did these intrepid pioneers leave Britain, and occasionally Europe, to undertake a perilous and uncomfortable voyage over an enormous distance to an unexplored country halfway around the world, where they would be effectively exiled from friends and family? Why did they commit themselves to bringing up their children in a hostile wilderness when there was little chance of ever returning home? The reason was that conditions in Britain were worse than those in the new colonies, brought about by the Industrial Revolution, population explosion, unemployment, unsanitary living conditions, the depressing effects of class divisions, European wars and religious persecution, and in the 1840s the Irish famine. It was easier for less privileged people to own land and possibly prosper in a small burgeoning country than in an over-populated homeland that was dominated by the upper class and landed gentry. Consequently, these 'escapees' became the lifeblood of the Australian colonies and helped to forge a new identity in a new land that did not have the prejudices of the 'Old Country'. Further reading: W Baldwin, The Country Life book of the living history of Britain, London, 1988.